February Gold has now climbed nearly $50 since turning on December 12 from within an inch of a 1237.40 correction target I’d flagged well in advance. 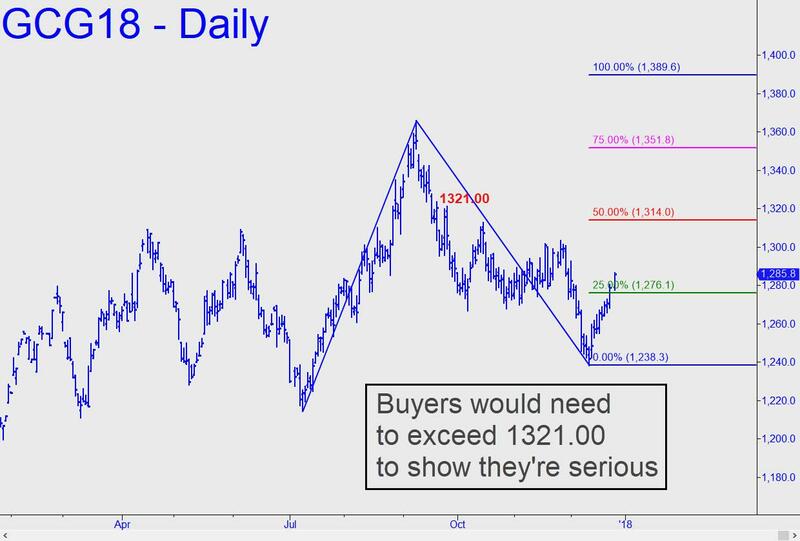 The futures were trading a few points below 1290 on Tuesday, but they will need to leap past 1321.00 to imply that buyers are serious. That would generate a bullish impulse leg on the DAILY chart. It would also exceed the 1314.00 midpoint resistance of a pattern projecting as high as 1389.60 (click on inset to see this). That target is fanciful at this point, but odds of its being reached would shorten with a decisive penetration of p=1314.00 or a two-day close above it.